Conversion of Some of Izates' Subjects. A district in Mesopotamia between the Upper Zab (Lycus) and the Lower Zab (Caprus), though Ammianus ("Hist." xviii., vii. 1) speaks of Nineveh, Ecbatana, and Gaugamela as also belonging to it. For some centuries, beginning with the first century B.C., it was semi-independent. In the Talmudic writings the name occurs as , and , which is parallel to its Syriac form "Ḥadyab" or "Ḥedayab." Its chief city was Arbela (Arba-ilu), where Mar 'Uḳba had a school, or the neighboring Ḥazzah, by which name the Arabs also called Arbela (Yaḳuṭ, "Geographisches Wörterbuch," ii. 263; Payne-Smith, "Thesaurus Syriacus," under "Ḥadyab"; Hoffmann, "Auszüge aus Syrischen Akten," pp. 241, 243). In Ḳid. 72a the Biblical Habor is identified with Adiabene (compare Yeb. 16b et seq., Yalḳ. Dan. 1064), but in Yer. Meg. i. 71b with Riphath (Gen. x. 3; compare also Gen. R. xxxvii.). In the Targum to Jer. li. 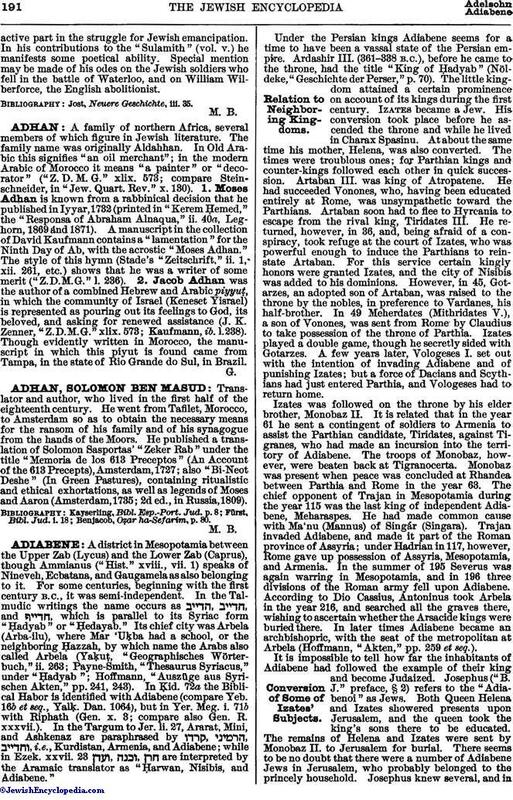 27, Ararat, Mini, and Ashkenaz are paraphrased by , , i.e., Kurdistan, Armenia, and Adiabene; while in Ezek. xxvii. 23 are interpreted by the Aramaic translator as "Ḥarwan, Nisibis, and Adiabene." Under the Persian kings Adiabene seems for a time to have been a vassal state of the Persian empire. Ardashir III. (361-338 B.C. ), before he came to the throne, had the title "King of Ḥadyab" (Nöldeke, "Geschichte der Perser," p. 70). The little kingdom attained a certain prominence on account of its kings during the first century. Izates became a Jew. His conversion took place before he ascended the throne and while he lived in Charax Spasinu. At about the same time his mother, Helena, was also converted. The times were troublous ones; for Parthian kings and counter-kings followed each other in quick succession. Artaban III. was king of Atropatene. He had succeeded Vonones, who, having been educated entirely at Rome, was unsympathetic toward the Parthians. Artaban soon had to flee to Hyrcania to escape from the rival king, Tiridates III. He returned, however, in 36, and, being afraid of a conspiracy, took refuge at the court of Izates, who was powerful enough to induce the Parthians to reinstate Artaban. For this service certain kingly honors were granted Izates, and the city of Nisibis was added to his dominions. However, in 45, Gotarzes, an adopted son of Artaban, was raised to the throne by the nobles, in preference to Vardanes, his half-brother. In 49 Meherdates (Mithridates V.), a son of Vonones, was sent from Rome by Claudius to take possession of the throne of Parthia. Izates played a double game, though he secretly sided with Gotarzes. A few years later, Vologeses I. set out with the intention of invading Adiabene and of punishing Izates; but a force of Dacians and Scythians had just entered Parthia, and Vologeses had to return home. Izates was followed on the throne by his elder brother, Monobaz II. It is related that in the year 61 he sent a contingent of soldiers to Armenia to assist the Parthian candidate, Tiridates, against Tigranes, who had made an incursion into the territory of Adiabene. The troops of Monobaz, however, were beaten back at Tigranocerta. Monobaz was present when peace was concluded at Rhandea between Parthia and Rome in the year 63. The chief opponent of Trajan in Mesopotamia during the year 115 was the last king of independent Adiabene, Meharaspes. He had made common cause with Ma'nu (Mannus) of Singár (Singara). Trajan invaded Adiabene, and made it part of the Roman province of Assyria; under Hadrian in 117, however, Rome gave up possession of Assyria, Mesopotamia, and Armenia. In the summer of 195 Severus was again warring in Mesopotamia, and in 196 three divisions of the Roman army fell upon Adiabene. According to Dio Cassius, Antoninus took Arbela in the year 216, and searched all the graves there, wishing to ascertain whether the Arsacide kings were buried there. In later times Adiabene became an archbishopric, with the seat of the metropolitan at Arbela (Hoffmann, "Akten," pp. 259 et seq.). It is impossible to tell how far the inhabitants of Adiabene had followed the example of their king and become Judaized. Josephus ("B. J." preface, § 2) refers to the "Adiabenoi" as Jews. Both Queen Helena and Izates showered presents upon Jerusalem, and the queen took the king's sons there to be educated. The remains of Helena and Izates were sent by Monobaz II. to Jerusalem for burial. 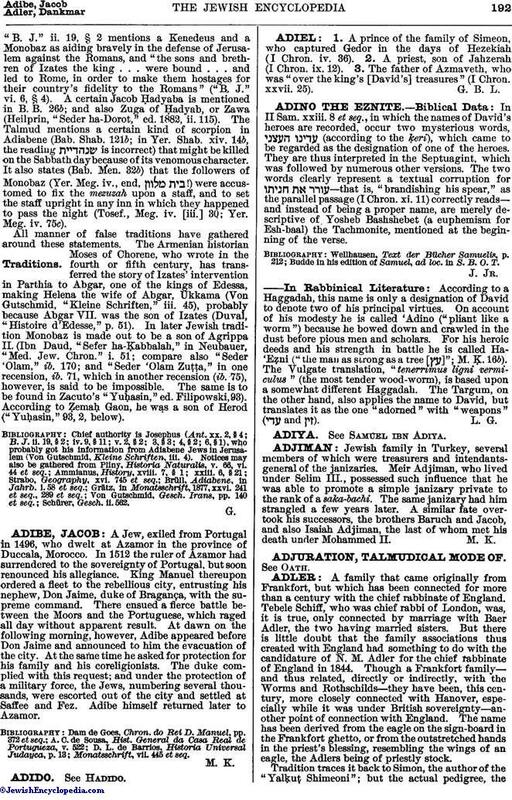 There seems to be no doubt that there were a number of Adiabene Jews in Jerusalem, who probably belonged to the princely household. Josephus knew several, and in"B. J." ii. 19, § 2 mentions a Kenedeus and a Monobaz as aiding bravely in the defense of Jerusalem against the Romans, and "the sons and brethren of Izates the king . . . were bound . . . and led to Rome, in order to make them hostages for their country's fidelity to the Romans" ("B. J." vi. 6, § 4). A certain Jacob Ḥadyaba is mentioned in B. B. 26b; and also Zuga of Ḥadyab, or Zawa (Heilprin, "Seder ha-Dorot," ed. 1882, ii. 115). The Talmud mentions a certain kind of scorpion in Adiabene (Bab. Shab. 121b; in Yer. Shab. xiv. 14b, the reading is incorrect) that might be killed on the Sabbath day because of its venomous character. It also states (Bab. Men. 32b) that the followers of Monobaz (Yer. Meg. iv., end, !) were accustomed to fix the mezuzah upon a staff, and to set the staff upright in any inn in which they happened to pass the night (Tosef., Meg. iv. [iii.] 30; Yer. Meg. iv. 75c). All manner of false traditions have gathered around these statements. The Armenian historian Moses of Chorene, who wrote in the fourth or fifth century, has transferred the story of Izates' intervention in Parthia to Abgar, one of the kings of Edessa, making Helena the wife of Abgar, Ukkama (Von Gutschmid, "Kleine Schriften," iii. 45), probably because Abgar VII. was the son of Izates (Duval, "Histoire d'Edesse," p. 51). In later Jewish tradition Monobaz is made out to be a son of Agrippa II. (Ibn Daud, "Sefer ha-Ḳabbalah," in Neubauer, "Med. Jew. Chron." i. 51; compare also "Seder 'Olam," ib. 170; and "Seder 'Olam Zuṭṭa," in one recension, ib. 71, which in another recension (ib. 75), however, is said to be impossible. The same is to be found in Zacuto's "Yuḥasin," ed. Filipowski, 93). According to Ẓemaḥ Gaon, he was a son of Herod ("Yuḥasin," 93, 2, below). B. J. ii. 19, § 2; iv. 9, § 11; v. 2, § 2; 3, § 3; 4, § 2; 6, § 1), who probably got his information from Adiabene Jews in Jerusalem (Von Gutschmid, Kleine Schriften, iii. 4).